Chief Justice of State Supreme Court, 1859-78. Conducted law school at Richmond Hill, his home, located 5 mi. NW. 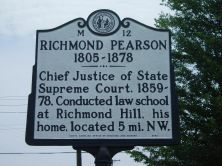 Richmond Mumford Pearson, jurist and law professor, was born on June 28, 1805 at the family’s plantation in a part of Rowan County that is now Davie County, the son of Richmond and Elizabeth Mumford Pearson. Richmond’s father had served in the American Revolution in the Virginia militia and an older brother, Joseph, served in the United States Congress. During his formative years, Pearson was mostly raised by his brother Joseph in Washington, D.C. Upon his father’s death in 1819, Richmond returned home and began attending Statesville Academy under the tutelage of the Reverend John Mushat. In 1820 Pearson entered the University of North Carolina where he focused heavily on history and philosophy. He graduated in 1823 and subsequently entered the law school of Judge Leonard Henderson held in Granville County. Among his fellow students was William H. Battle, who later became Pearson’s foremost rival in legal education. 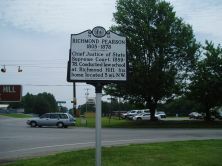 In 1826 Pearson established his law practice in Rowan County, and three years later entered public life as a representative to the state House of Commons. In 1835 he lost a bid for Congress, but was elected instead as a circuit court judge. Twelve years later he was appointed to fill the seat of state Supreme Court Justice Joseph J. Daniel, and a decade later was named the chief justice after the death of Frederick Nash. 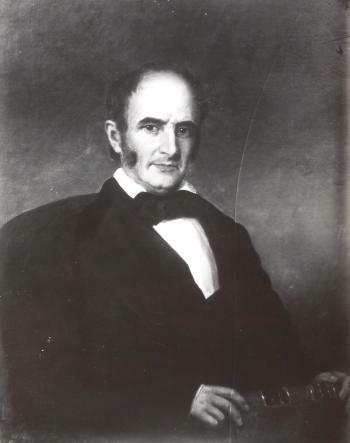 Although he made his reputation in judicial and political circles, Judge Pearson is best known for his law school, which he opened in 1836 in Mocksville. Ten years later Pearson moved the academy to Yadkin County where he had purchased a large plantation which he named Richmond Hill. Pearson himself later claimed to have instructed “more than a thousand law students” at the school, many of whom went on to great acclaim in the judicial and political world. Three of his pupils, Thomas Settle, William P. Bynum, and William T. Faircloth, later served under him as associate justices of the state supreme court, while three others including Alphonso C. Avery, David M. Furches, and William A. Hoke served on the court after Pearson’s death. Students Daniel G. Fowle, John W. Ellis, and Robert B. Glenn became governors of North Carolina, while three others, John S. Henderson, Joseph J. Martin, and William H. H. Cowles became Congressmen. Pearson married his first wife, Margaret McClung Williams, the daughter of Tennessee senator John Williams, in 1832. She died in December 1855 at Richmond Hill, having given him ten children. One of them, Richmond Pearson, became a prominent Republican legislator in the late nineteenth and early twentieth centuries, and established a home in Asheville, also known as Richmond Hill. Pearson married his second wife, Mary McDowell Bynum, in 1859 at her ancestral home, Quaker Meadows. On January 5, 1878, Pearson was in a buggy on his way to Winston, planning to take a train to Raleigh for the January term of court. Although there were no signs of illness, he died shortly after reaching the city from “paralysis of the brain.” His body was taken to Raleigh, where he lay in state in the State Capitol rotunda until the afternoon of January 9, when his remains were laid to rest in Raleigh’s Oakwood Cemetery.